There are over 22,000 college students in Tyler. Why don’t they vote? As all Texans gear up for the most pivotal midterm election in recent memory, we’re taking a closer look at low rates of participation among Smith County’s youngest voters—and how local students across the political spectrum are trying to change the equation. In the last three American midterm elections, Texas tied for the worst rate of voter turnout in the country. Barely 1 in 3 eligible Texans voted in those elections. Here in Smith County, turnout was only marginally better: about 39 percent of registered Smith County citizens cast ballots in November 2014. In Tyler and across the country, age is one of the biggest predictors of whether someone will vote. The older you are, the more likely you are to cast a ballot. During the 2016 presidential election, 18 to 24 year olds had the lowest rate of voter registration of any age group in Smith County. Of those who did register, significantly less than half ended up voting. The more than 22,000 students who study at our three local colleges are potentially a huge political force, but when it comes to voting, they have an enormous gap to close. Why do so many local students fail to register? And even when they do register, why do the vast majority fail to cast a vote? What are the obstacles—and, as all Texans gear up for the most pivotal midterm election in recent memory, can they be surmounted this time around? Over the summer, there were hints of a shift across Tyler and surrounding Smith County. Elections administrator Karen Nelson says that as of Monday, 213 volunteers have signed up to help people fill out registration cards and bring them to the elections office. She can’t remember a previous election cycle in which so many people volunteered—and this year’s most active volunteers are far younger than she’s used to seeing. Several U.T. Tyler student registrars have been showing up at her office two or three times a week to submit small stacks of new voter registration cards. “I’ve never seen the energy these kids have,” says Dr. Robert Sterken, a U.T. Tyler political science professor who was involved in organizing a nonpartisan voter registration drive on his campus earlier this month. Iniguez signed up as a volunteer in Smith County a few weeks after becoming a naturalized citizen. She has since expanded her efforts to neighboring Gregg County and to Harrison County, where her family lives. That meant she recently had to to carve out time between classes and drive 120 miles round-trip to deliver batches of filled-out voter registration cards to Harrison and Gregg County elections officials. Iniguez says she’s more than halfway to her goal of registering 100 people before the Oct. 9 deadline, but she’s seen firsthand how challenging it can be to engage Latinos in the political process. While helping register voters at Longview’s recent East Texas State Fair, she says, she was saddened by the number of Latinos she approached only to have them quietly confide that they weren’t citizens. It was also clear to Graves that some students came from families with no history of voting. “One boy got on the phone and called his mama,” she recalls. “He asked his mama, should I vote? 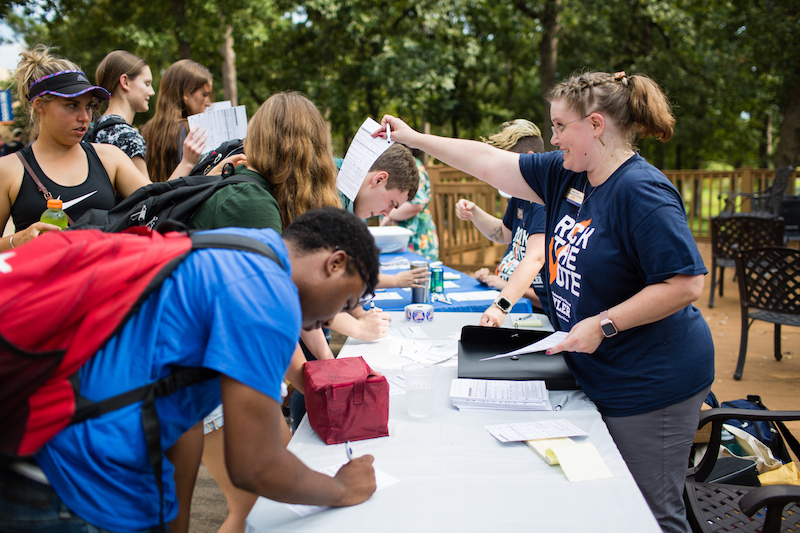 Should I register to vote?” Ultimately, she and other volunteers got 56 new registrations at the North Tyler campus, while League volunteers working at TJC and U.T. 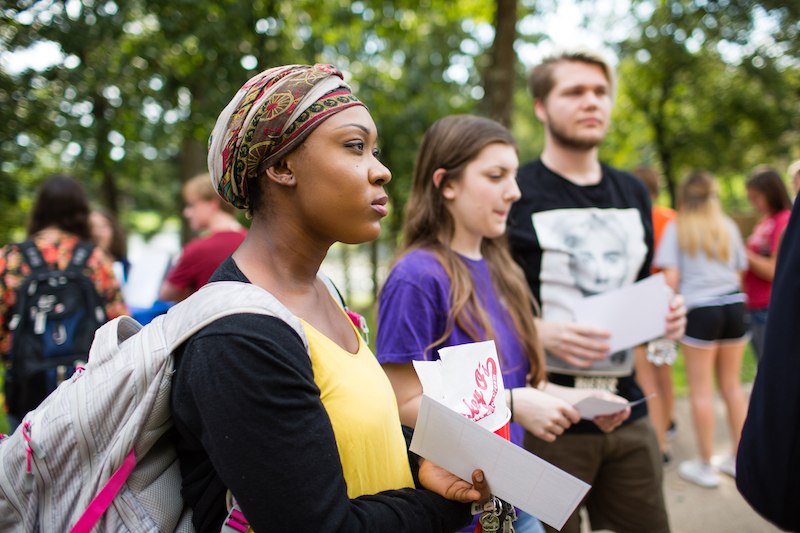 Tyler for National Voter Registration Day scored more than 100 new student registrations. Ronald Hollins, a TJC student who graduated from high school in Quitman and now lives in Tyler, recounts similar experiences. Hollins, 28, is studying psychology online while working full-time at a local nonprofit organization and part-time at at a local grocery chain. Active in the local Young Democrats club, Hollins says he’s gotten used to circling back repeatedly before some people agree to register. But Hollins, who is black, says he’s been heartened that a number of his friends of color and friends and fellow allies in the area’s LGBTQ community have signed up to vote for the first time. “A lot of them have said there’s more at risk than there was before,” he says. U.T. Tyler political science professor Sterken and Misty Holmes, a political science department administrative coordinator who co-organized Rock the Vote, a campus-wide voter registration event held last week, note that Republican students on that campus have been relatively dormant this year. Hannah Cooper, a U.T. Tyler political science major who served as treasurer for the school’s Campus Republicans club in the 2016-17 academic year, says that group “kind of fizzled out” that year. What political buzz there was on campus quieted after the presidential election, and the club’s president and vice president turned their attention elsewhere, she says. A political activist since she began volunteering for Governor Greg Abbott’s campaigns as a sophomore at Robert E. Lee High School in Tyler, Cooper says she’s heard interest in from other U.T. Tyler students in getting involved and rebuilding the campus club. But in addition to managing her classwork, she is treasurer of the Smith County Young Republicans and a senator in U.T. Tyler’s student government, works part-time on campus, and regularly canvasses for Abbott and other Republican candidates. She is also a volunteer deputy voter registrar, but on the day that the political science department held its nonpartisan voter registration drive, Cooper says, she had to be out of town for a state Young Republicans convention. Cooper says she’s excited about the growth of the county’s young Republicans club, which is aimed at 18 to 40 year olds and has grown to 64 members since it re-launched last year. In July, Ted Cruz came to Tyler to speak at a private gathering sponsored by the group and brought his father along. Cooper, a member of the board, wants a similar reboot for U.T. Tyler’s campus Republicans but says it may to wait until next spring or fall. “I think it comes down to not having time,” she says. 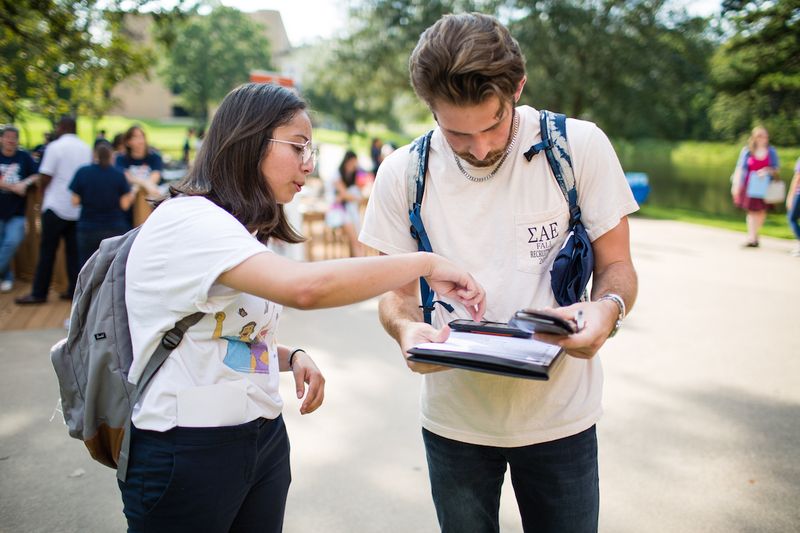 Student activists have also tried to find opportunities to reach students in group settings, where people can be more easily persuaded to fill out registration cards together. Iniguez, Ortega and their friends regularly ask professors to allow them to come to classes and hand out registration forms. They’ve also helped sign up nearly 50 people who attended recent rallies for U.S. Senate candidate Beto O’Rourke at Jarvis Christian College in Hawkins and Texas College in Tyler. Last week, Iniguez and Ortega helped sign up several voters during U.T. Tyler’s Rock the Vote. 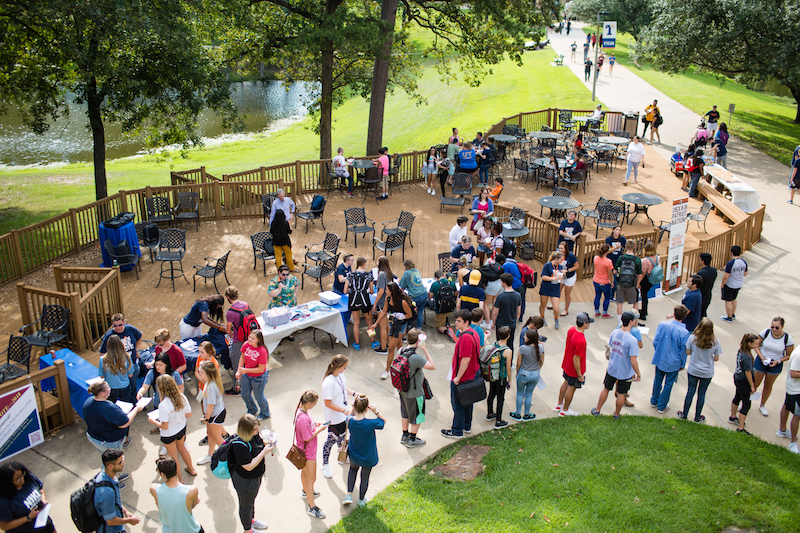 That event drew more than 350 students and 75 new Smith County voter registrations with free ice cream and tacos, and opportunities to earn t-shirts by talking with city, county, and statewide elected officials. The student government at TJC is planning a similar voter registration event on October 2nd on that campus. Some professors have also gotten in on the action. Tyler Junior College criminal justice instructor LaRhonda Hamilton says she became a volunteer deputy registrar after seeing an N.A.A.C.P. invitation on Facebook for a training session. A Crocket native who served in the Army as a logistics supply sergeant for 20 years, Hamilton is a recent Tyler transplant. Six people signed up to vote during the first class where she made her pitch, and she’s aiming for at least a dozen more. She hopes to convince her students that they can change a political process that she says has grown too divisive and too distant from people like them. “I want to be a part of the change,” she says. So, is all this activity working? As of Wednesday, slightly more 18-to-24-year-olds in Smith County have signed up than in 2016. But that uptick could reflect population growth as much as any shift in civic engagement. Meanwhile, seasoned local election watchers caution that while all the activity of new student registrars has been exciting to watch, their efforts to find new young voters one-by-one won’t necessarily translate into enough votes to swing results their way. Adding to the challenge, turnout across America has always been lower in midterm elections, like the one this November, than in presidential elections. In 2014, not even a quarter of Americans ages 18 to 34 voted in that year’s midterms. What’s more, local data that from past elections indicates that there is often a significant gap between those who register to vote and those who actually cast a ballot. 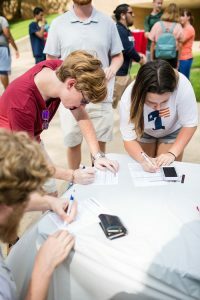 While nearly 60 percent of 18 to 24 year olds in Smith County were registered to vote in the 2016 presidential election, less than a third of those who registered ending up voting. Here, as across the country, younger voters who are recent transplants or just here for school may have difficulty in obtaining the photo ID required to vote in Texas. More young voters of color report being affected by that obstacle than do young white voters. Others feel they’re too busy with their studies and jobs to go through the process of applying for and then returning ballots by mail before election deadlines. Transportation can also be an issue. “There’s a structural impediment,” says U.T.’s Sterken. The closest election-day polling place is a mile away from the center of the U.T. campus, and the closest early-voting site is downtown, four and a half miles away. Students without transportation at both TJC and Texas College face two-mile treks downtown to vote early, but can walk 10 to 20 minutes to reach the polls closest to their campuses on election day. Local students also say Texas’s voter registration laws can be discouraging. Beryauna Koontz, a 23-year-old public health major at U.T. Tyler, stood in the registration line at Thursday’s Rock the Vote event but ultimately decided not to register in Smith County. A senior, Koontz says she’ll soon leave Tyler and doesn’t have time or energy for the kind of hassle she faced as she tried to vote in her home precinct in Houston in 2016. She attended college in Stephenville at the time, two hours southwest of Dallas, and didn’t realize that registering to vote there meant she couldn’t vote in her hometown. She was back home for the presidential election and ended up driving for hours across Houston to cast a provisional ballot. “I don’t want to go through that again,” Koontz says. She predicts she’ll skip this election and wait for the presidential race in 2020. There’s plenty of research showing that voting is a habit; do it once, and you’re more likely to do it again. That’s been true of young voters in the past, even in midterms. That said, Sterken and other political observers say there’s also a risk that the young people who have engaged this election cycle could burn out if it doesn’t go their way. “The kids may turn off completely and permanently,” he says. Tyler’s young activists say they recognize that all they want to accomplish won’t happen in a single election. Iniguez, the Latina student organizer, points out that she and her friends have already endured setbacks and defeats. Last winter, she traveled to Washington, D.C. to push for an extension of legal protections for DREAMers, young undocumented immigrants brought to this country as children. Lee Hancock is a veteran investigative journalist who's covered corruption, crises, conflicts and natural disasters at home and overseas over two decades with Dallas Morning News. She is the author of upcoming book of the 1993 Branch Davidian siege and its impact on popular culture, with an M.F.A. in creative writing from Bennington College.